← Seriously: Would you buy these products? The spectacular U-shaped Zafarraya Pass (El Boquete de Zafarraya) which marks the boundary between the provinces of Málaga and Granada can be seen for miles around. 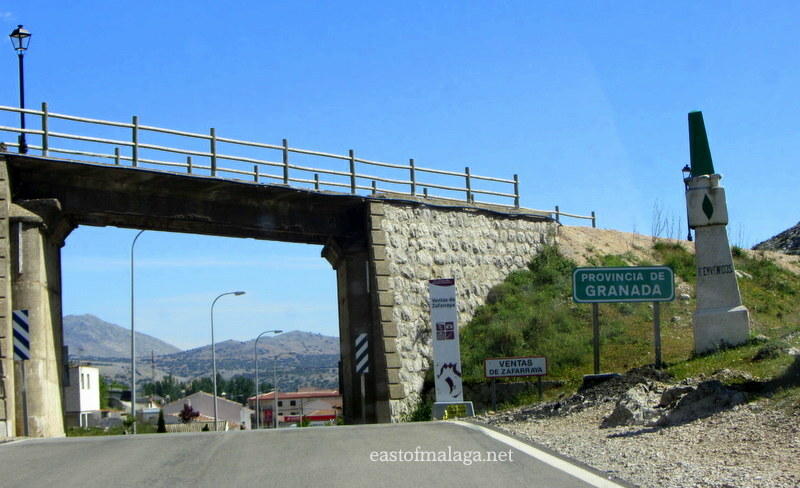 Standing impressively over 900 metres above sea level, the Pass has been used for centuries as a key route through the sierras, linking lands south-west of Granada, with the towns and villages along the coast, east of Málaga. 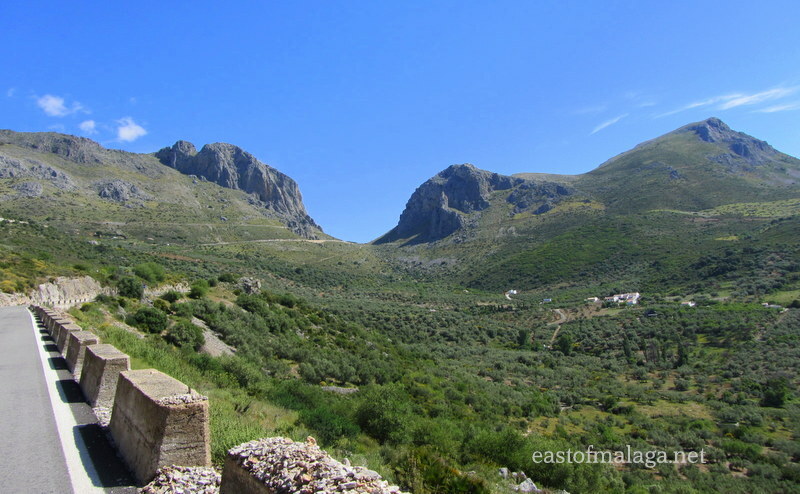 Although I have made the journey through the Pass many times, I never fail to be impressed by this ancient route through a huge cleft in the mountain spine of the Sierra de Alhama. The name Zafarraya may have come from the Arab Fahs al-raiyya meaning “field of shepherds”, although there are people who think it derives from Saiarraya, meaning “territory limit”, referring to the fact that at one time Zafarraya belonged to the province of Málaga. To get there, we drove north from the A7/E15 Autovía del Mediterraneo, past the town of Vélez-Málaga and briefly alongside Lake Vinuela, before heading up the A402, a winding mountain road towards the Pass. Along the way we stopped at the ruins of Zalía castle (castillo de Zalía) which sits on a hill opposite the white Andalucían village of Alcaucín. It is thought that the Phoenicians established the foundations of the fortress, but the castle was later built by the Moors around the 10th century to guard the ancient Nasrid Route through the Zafarraya Pass from Granada to Málaga. Even though many of the wildflowers I have told you about over recent weeks have now started to die back near to where I live, they are still flourishing in abundance further inland, so we stopped many times to take in the natural beauty as well as many photographs. In 1979, a cave was discovered near to the Zafarraya Pass (Cueva del Boquete de Zafarraya), with a subsequent archaeological dig unearthing the best preserved remains of Neanderthal man (radiometrically dating back 30000 years) ever found in Western Europe. Importantly, the find was one of the first pieces of definite evidence showing that Neanderthals co-existed with modern humans for almost 10,000 years, disproving earlier theories that they had been quickly replaced by modern man. 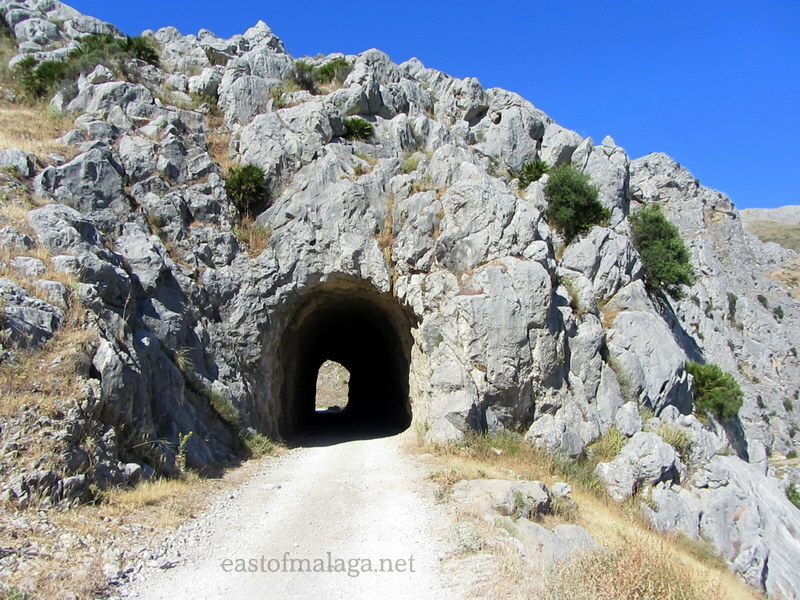 As we approached the gap in the mountains, the entrance to a small tunnel through the rock can be seen, which was once part of the former Periana to Zafarraya railway line, abandoned fifty years ago. The tunnel is now used by walkers who enjoy strolling along the former railway line, which is now a dirt road. The old railway bridge across the road as you drive through the Zafarraya Pass is a more obvious relic of the old railway line. It is here that you can find the village of Ventas de Zafarraya, so named because in times long past, travellers would stop for food and shelter at one of the local inns (ventas), where they could also exchange and refresh their weary horses and oxen, before continuing on their long journeys. These days, Ventas de Zafarraya is almost entirely dedicated to vegetable growing on the fertile, flat land just beyond the village, where many different vegetables including lettuces, artichokes and beans are grown up rustic canes cut from nearby river banks. Many of them are not much bigger than my little veggie plot at home! This entry was tagged Andalucía, culture, customs, East of Malaga, Europe, flowers, history, life, Malaga, photography, Spain, travel, Ventas de Zafarraya, white villages, Zafarraya Pass. Bookmark the permalink. Pingback: The Spanish Postal Delivery System | East of Málaga .... and more! Marianne, these look so beautiful! I can’t to see these places myself. I adore that picture with the cacti in the foreground, and also the gardens of lettuce and the colorful wildflowers. This is my kind of place for sure! Dear all, this is a beautiful area, with stunning views and charming people. When we were there, we immediately fell in love with Andalucia! Glad you enjoyed your stay, Leen – and thanks for the recommendations! The idea of Modern man co existing with Neanderthal man for 10000 years is so fascinating! Fab shots Marianne, particularly that view towards Alcaucin fom Zalia castle. love your photos….we live in Alcaucin and do this walk with our dogs regularly..the wild flowers have been stunning this year, maybe because of all the rain we’ve had. I’m glad you enjoyed the photos – I had fun taking them, that’s for sure! I think you’re right, the rain must have made a big difference to the wildflowers this year. We are so lucky to be able to walk in the footsteps of Neanderthal man, right on our doorsteps, aren’t we? The whole post is really interesting, and the photos are great. The pass is very striking shot from a distance. 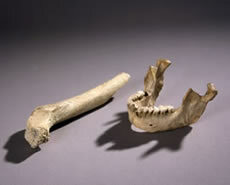 It is so very cool about the discovery of the Neanderthal remains. Thanks Naomi – yes, the pass is very striking to see from a distance, and gets more and more intriguing as you get closer. Me too, Linda – there is a real connection with the past, isn’t there? Thank you for the lovely tour – a little Spanish adventure for my evening! Though the backdrops are spectacular, I’m most taken by the beauty of the flowers in these photos! Thanks EllaDee – I didn’t know either until I started my research for this post. It’s always rewarding though to find out new interesting information. Thanks Paddy – yes I guess that’s so – but in any case, it’s almost impossible to have railways in such mountainous countryside. Well er …. they have a few scary shepherds! Love the flowers, what a beautiful area to travel through. Hi Jo – that’s a lovely drive, isn’t it? Ah yes, the wildflowers have been even more gorgeous than usual, this year, I’m sure of it! I’m sure you would too, Ruth. I hope you get the chance to visit one day. Really beautiful blog Marianne, simply loved the bright sunny pictures, the reference to neanderthals co-existing with humans? Is that true? I did not know this . Also I really want a nice fresh salad now after seeing the garden! Yes, it is true – and it was the find in the cave near to the Zafarraya Pass that finally confirmed it. I plan on coming !! 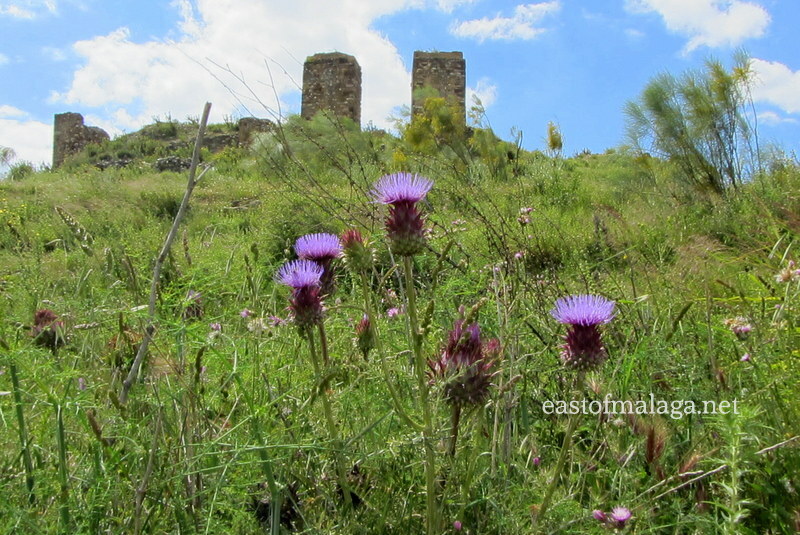 Thanks Sonel – the purple flowers were VERY prickly thistles! Really enjoyed reading this as Big Man and his family are from Ventas (the petrol station and restaurant there are all part of the family businesses). Although it’s not a pretty town, it has an interesting history with these findings an yet we’ve never stopped to do the walk…time to put this right! No, it isn’t a pretty town, but as you say, the history is amazing. The walk is VERY pretty at the moment (we went on Wednesday), especially with the wildflowers still out. Very interesting piece with great photos – thanks! It`s amazing to see the growth all along in those fields. And that`s an interesting stone wall. They seemed to level it off after every row of stones. I`m a sucker for poppy pics. Love your one. Now, just send some of that sunshine up here to Ireland. Please! The land is so mountainous around here, that it’s quite unusual to find a large area of flat land, so naturally, it is used for growing produce. It’s a stark contrast once you drive through the Zafarraya Pass – in fact the first time I drove through I was amazed! Yes, you’re right, the stone wall of the castle was really interesting. It really shows the workmanship, doesn’t it? Haha! Sunny here this morning! I am impressed by your magic powers! Thanks for the geography lesson. One could `wiki`or google but I love getting a sense of a location from a person living there.